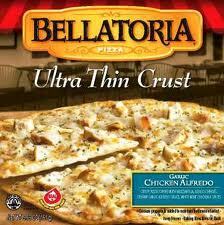 Costco has the Bellatoria Chicken Alfredo Pizza 3-pack box on sale for $9.89 (after manufacturer’s instant rebate). That’s $3 off the regular price making each pizza just $3.30. It’s an ultra thin crust pizza topped with a creamy garlic Alfredo sauce, white meat chicken, asiago and mozzarella cheeses. There is no limit on how many you can buy at this price but the offer does expire on Sunday, September 18, 2011. Price and participation may vary. Thanks!